Students-Back Row From Left to Right: Roxy Eickhof, Peyton Briggs, Sarah Flick, Annabelle Callaway, Katlyn Scheer, Skott Hansen, Isaac Nebeker, Hunter Laudert, Logan Bowers, Bryce John, Josh Rocha, Mark Henderson, Abagail Runser, Jennifer Rangel, Woody Smith, Olivia Gines, Kiya Kelsey, Dale Schoth, Alex Hatfield. Front Row From Left to Right: Mrs. VaLeen Henderson, Mrs. Holly Church, Louie Bettencourt, Mr. Jon Goss, Mr. Damon Schoth, Mr. DJ McCarty. (Jerome, ID) –What started as one young man’s senior project of raising money for new football helmets for his team, has turned into something much bigger. Seeing the need for additional support, three local companies teamed up to boost extracurricular programs at a local school. 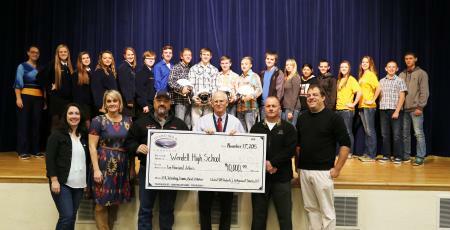 Bettencourt Dairies, Idaho Milk Products, and Magic Valley Compost presented Wendell High School with a donation to support Drama Club, FFA, Band, Technology, and the Athletics Department. After talking with teachers at Wendell High School, Bettencourt Dairies, LLC. owners, Louie and Sharon Bettencourt, felt that those groups had the greatest need for support. “Every student is entitled to an education of English, Math, History, and Science. Programs such as Drama, Band, FFA, and Athletics are additional educational privileges that are a real asset to open their mind to express themselves. I know how hard it is to raise money for extra things these teachers would like to provide a student to help them grow or see things differently. These funds will help the school give that little extra”, said Sharon Bettencourt. The students and staff of Wendell High School were very appreciative of the donation made to programs that usually require hours upon hours of fundraising or applying for grants to function. The Wendell High School, for instance, has had the same curtains in the auditorium that were installed when the school was built in 1993. With their portion of the donation, the Drama Club plans to order new curtains for the stage. Mr. McCarty, Band Teacher, at Wendell High School wants to put on more concerts and buy needed equipment. FFA students are planning to hold more FFA events, go on field trips and purchase items to have a better understanding of the farming and dairy industry. New football helmets have already been purchased and put to good use for the Football Team. Magic Valley Compost, established in 2006, is a locally owned company specializing in agricultural, landscaping, and erosion and sediment control compost. They are a proud participant in the Idaho Preferred brand and recognized by the Northwest Center for Alternatives to Pesticides Business League in 2011. Magic Valley Compost actively seeks out new ways to partner with local growers and developers to help stimulate the Magic Valley economy with new and innovative ideas for renewable energy, dairy needs, and manure management. Wendell High School is a four-year public secondary school located in Wendell, Idaho. It is the main high school operated by the Wendell School District. Wendell High School is a 2A school with about 335 students currently attending.